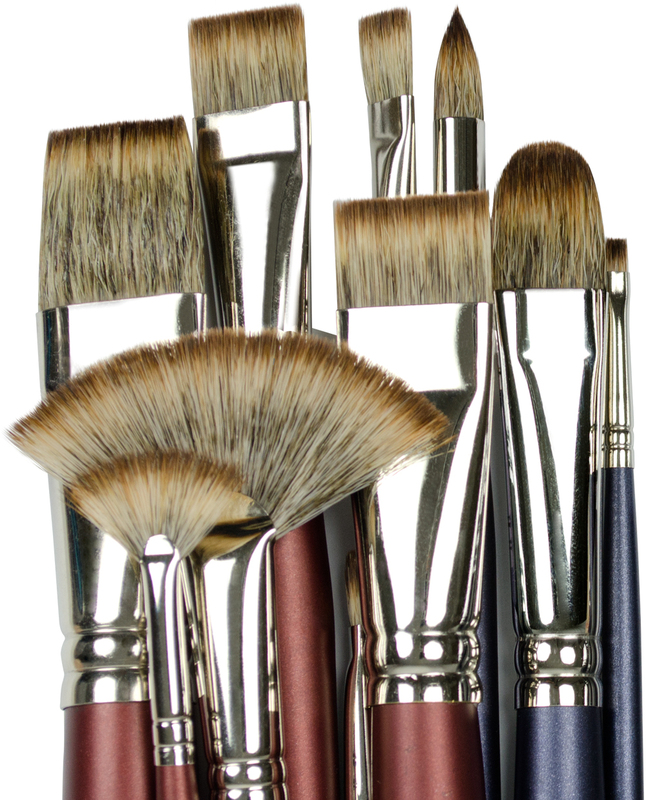 Artist Paint Brushes will become your favorite tools the more you use them! As you create, you will become increasingly more familiar with the way the brushes handle the paint and what they can accomplish for you. Soon the paintbrush will become a part of you that you intuitively know how to master its capabilities. If you're just starting out, it can be a bit overwhelming standing in the Paint Brush aisle at the art store, with such a large selection of Artist Paint Brushes presented before you. Such selection can be very challenging. No fear – Royal & Langnickel has created this easy to use guide! In this section we will provide you with everything you need to know in order to select the right Paint Brushes to suit your needs. Choosing a brush can be challenging. There’s wide range of hair types, head shapes and handle lengths. The terms listed below should assist you in selecting a brush type. Is a synthetic brush, the hair mixture is specifically made for use with acrylic paints. Like a filbert, these are versatile and can be used in both general painting as well as detail work. Hairs which are missing their natural tips. Blunts or trimmed hairs are not found in Quality brushes. A chisel ended, square headed bristle brush that are typically short and flat. A Coarse hog hair brush. Its strong hair works well for thick brushwork in oil and acrylic painting. The better the quality, the easier they can carry more paint and keep their shape when wet. Commonly used in illustrations, has an elongated round sable. Is an extra-long flat brush that has oval shaped heads, available in both bristle and soft hair. A flat fan, is used for blending, available in both bristle and soft hair. Are flat brushes with oval shaped heads, available in both bristle and soft hair. Is the natural, split tip of each bristle. Flags carry more paint and are found in the higher quality hog brushes. Are long and flat hog brushes with a chisel end. Are used to make good mop wash brushes. Is a large, round, domed brushes, often goat or squirrel, used primarily to cover whole areas in watercolor. A flat soft hair brush which allows an area to be covered in one stroke, traditionally used in signwriting for block letters. Are flat wash brushes created from ear hair. Are very thin, long round sable and are traditionally used for painting rigging in marine pictures. Has a pointed tip and long closely arranged bristles for detail. Produces the best soft hair brushes, especially for watercolor. The conical shape and scaled surface of each hair provide a brush with a preferred point, responsiveness and paint carrying capacity. very thin, long, chisel ending sables, that are traditionally used for lines and letters in signwriting. Has extra short and small sable rounds, is used for retouching photographs and other high detail work. The degree of resilience of the hair and its ability to return to a point. Large flat soft hair brushes, used primarily for flat washes in watercolor.